We don’t often have the time to do full album reviews these days, too much real life to contend with, but occasionally one comes along that we just have to write about. Here at electronic rumours we have a kind of broad spectrum love of electronic music. We have an absolutely love of Pop music, absolute love of dance music and have an absolute love of Experimental and left-field electronics (this can be attributed to the various genres of electronic music with been into over the past god-knows-how-many decades) and it’s rare to find a single artist that encompasses all our fields of synthesizer music interest, but Little Boots does. electronic rumours has grown up with Little Boots in a way, having launch the website just after Stuck On Repeat was released in 2008 (post-her leaving Dead Disco). Hailing Victoria Hesketh as everything right with UK SynthPop, we followed her career through the early singles and YouTube videos to her major label début album Hands in 2009. Hands, while obviously being the result of a push to make Little Boots a bona-fide Pop Star (something she didn’t need any help with, having already become so organically), Hands revelled in Victoria’s Italo, Disco and SynthPop influences and wore her love of interesting synthesizer music on it’s sleeve through the glossy Pop veneer. 2013’s follow up album, Nocturnes, allowed Boots, now free of major label constraint to deliver a blistering journey through dark Techno and Deep House in an ElectroPop vessel; truly Avant-Garde in places, perfect Pop in others. This interweaving of catchy hits, intoxicating floorfillers and synth geek noodling appeals to all our interests, and it’s why we’ve been on team Boots since day-one. The reason for telling you all that is context; Victoria releases her third studio album, Working Girl, this week and it really does sound like distilled Little Boots. Listen up. You can’t really begin to talk about Working Girl without briefly touching on aesthetics. 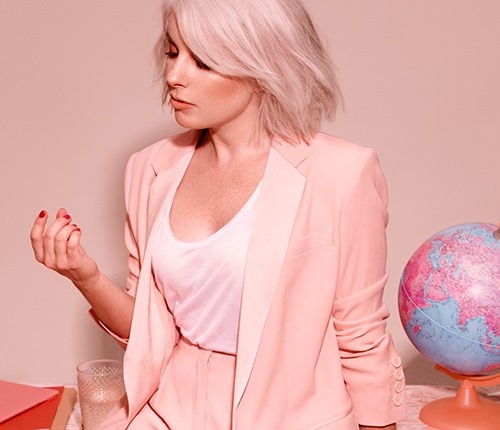 We’re not in any way a design website so we won’t go on about it but we are enjoying Little Boots’ 80s pastel power-suited vibe for two reasons. Firstly we love a good concept, and speaking of her time in the music industry resulting in her taking control of her own career and setting up her label, On Repeat Records in a fun, nostalgic way works brilliantly (have you seen the accessories? post-it notes and whatnot. marketing genius!). Secondly; 80s nostalgia is used a lot these days, by a lot of artist, but it’s always the same. The whole palm tree, laser grid, that Purple Rain font, vibe is all well and good if that’s your jam but it;’ not really representative of the actual 80s. It’s especially odd when we see UK artists claiming retro credibility while using imagery that bears little to no relation the the experience of Britain in that decade (save for the odd TV advert). It’s not so often that an British artist comes along taking cues of a particularly British style of 80s as Victoria has done here, it makes it feel more authentic and relatable. (Sorry for sounding all *shudder* UKIP for a second there (“British 80s for British people!” LOL), but the fact is that the 80s didn’t just happen in Miami, which we think most bands seem to forget.). So, to the music. Little Boots drops you right into the vibe with a Remedy backed answering machine Intro before launching right into the album’s title track (and also we would imagine Victoria’s theme tune), a well rounded DancePop track that has a classic boot’s sound with an added huge, growling, bassline. Really, the track sums up Little Boots for us; deep and heady grooves, playful and noisy synths, and cheery Pop vocals that belie a razor sharp sarcastic wit. No Pressure drags the album straight to the dancefloor with one of the records finest grooves. A sleek 90s House sound permeates No Pressure and Victoria’s hushed performance glides over a hook worthy of your finest warehouse moves. No Pressure’s hypnotics sit in contrast next to the driving synth Funk of Get Things Done, with a Bootsy-esque bassline and energetic melody supporting Victoria’s motivational mantras. Working Girl comes complete with a few track from Little Boots’ Business Pleasure EP of earlier this year. The eclectic tribal alt-Pop of Taste It and the lush 90s DancePop of Heroine are present and correct alongside the EP’s rapid fire title track manifesto. Elsewhere the record glides effortlessly from one feel to another as the pulsating American Pop stylings of Real Girl play out shoulder to shoulder with the dreamy, almost Chillwave, swirling and reverb washed sounds of Help Too. The Game injects the album with some serious late 80s Top Of The Pops vibe. A rich and jaunty ElectroPop tune with a nod to piano House and a beat that would be right at home on Radio 1 in 88. We get eased out of Working Girl with the lush, emotional Paradise and the first single from the album, Better In The Morning; a track that is exemplary of Little Boots’ lovable quirk-Pop. An intimate and carefree tune that leaves the listener on a high. And there we have it; Working Girl is definitely an album worthy of your attention and another example of why Little Boots is probably the most interesting SynthPop artist working today. Leave your preconceptions at the door. I always set my expectations high for Little Boots and she always manages to surpass those expectations.